The State Route 160 widening project is set to have the first portion of extended lanes open up next month. An area at the start on the Las Vegas side of the project where homes are present will have its current two lanes expanded to four lanes open to motorists in June. The portion of the highway will be the only one opened by itself, as the rest of the five-mile project will be opened after the entire project is complete. “The remaining four miles will be built and widened together,” Illia said. 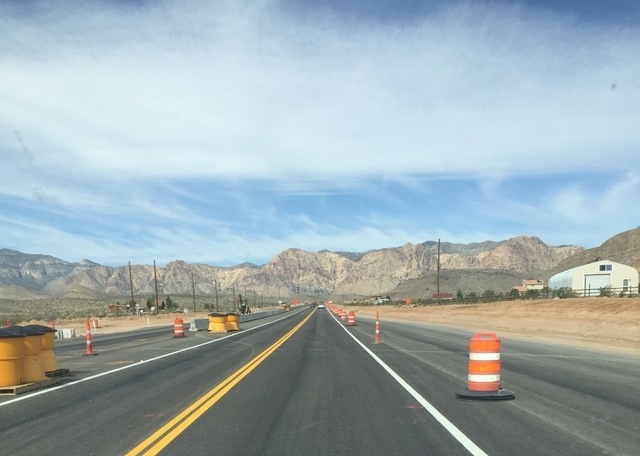 Improvements in the $16.5 million project, which runs from mile marker 10.89 (just past the Red Rock Canyon Road junction) and mile marker 16.63, include flattening side slope shoulders for safer vehicle turnouts, while installing new drainage pipe and tortoise fencing. Other work consists of placing barriers and guardrails as well as hydro-seeding 38 acres. The construction process will involve moving enough dirt to fill 1,800 average-sized swimming pools and enough asphalt to pave 8,000 driveways. The stretch of road has seen its share of vehicle crashes, with many of those resulting in fatalities. Just last month 77-year-old Richard Caffejian, Pahrump, died after his pickup truck crossed over into oncoming lanes on SR-160 in Mountain Springs, colliding head-on with a Hyundai SUV. Two women in the SUV were also injured as result of the crash. The entire project is scheduled for completion in early 2017.